When it comes to getting WA referrals it would be wise to know of the different ways to get people to join Wealthy Affiliate, so you can maximize your chances of landing an accepted invitation. Everyone will have a minimum of 6 ways to get people to sign up to WA. If you have a website that promotes WA then you will have a minimum of 2 extra ways for getting referrals. In addition everyone has access to create a personalized custom WA Home Page and a custom Sign Up Page. So if you are like me, you will have a total of 10 ways to get people to join WA. NOTE: EVERYTHING DESCRIBED BELOW IS AVAILABLE ON YOUR WA AFFILIATE PROGRAM / LINKS & TRACKING PAGE. NOTE: The bottom 2 links are my Custom-Made Sign Up and WA Home Page Affiliate Links. *** Means that you must be in a private browsing mode like Google Incognito Mode to view these links as a non-WA member. The first one is a comparison table you can make to compare Wealthy Affiliate with other somewhat similar work at home programs like Empower Network and the like. Then you also have a Site Rubix plugin where anyone can create their own Site Rubix website by typing in a domain name. Both of these plugins will lead to a WA signup page. Thanks so much. I've learned a lot. Bookmarked. You are welcome Arline. Happy to have helped you. How to customized Home Page????? 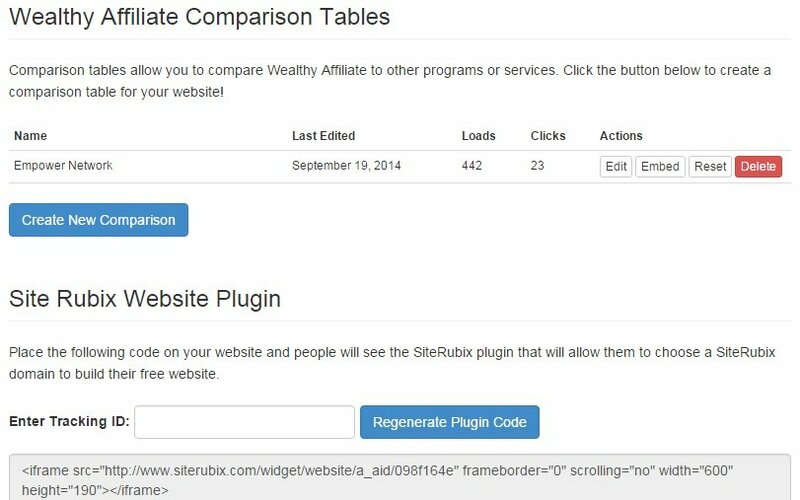 Log in to your WordPress by going to SiteRubix (the light blue button on the left) and then SiteManager. When you are in the WordPress back office clink on Appearance/Customize. All the options are in there. Let me know if there is something else about customizing the home page that you need to know. I'll see if I am able to help you further. I believe she is talking about the WA Home Page and not her website home page. You're welcome. I'm happy to hear that boomer was able to assist you. He is a great help. Thanks for the details given here. Loved the way you presented your material. Very logical and well thought out. I have learned a lot. Plss can you show us how to make step by step in order I can catch up and also others!!!! This is great i saw it with others but I really big question how they do it? See the link I shared in your other comment. Hi boomer. Is there any chance that you could do a short tutorial on how to create a custom link? Use the Shortlinks by Pretty Link Plugin. Thanks, Craig. I'll have a look at that. Hi boomer, thanks for the links. I'll check them out. Great explanation of entrance points for referrals. Very clear and easy to read. Thank you. I am happy you found this information easy to read and understand. Your training was very clear and appreciated. I will refer to it as I proceed. Thank you Marv. I always try to make all of my tutorials as clear and simple to understand as possible. I needed this and got it from you. Thanks for creating this easy to follow lessons. It was my pleasure to have created this training for you and the WA community. You are welcome Rika. Happy to have made the entrance point meanings clear to you. WA has since removed the blue Facebook Like button from all screens on WA. The Guest Join Form V2 replaces the Guest User Modal which is what a non-WA member sees about 15 seconds after viewing a WA blog or training tutorial. Awesome Robert... thankin' ya' sir! Thanks! I needed this information, too! Thanks I was wondering what Guest User Modal meant on referrals. Now I know. Thnx, Rob. Very insightful information. Thank you very much for the great training. You are very welcome. Happy you liked it. Can I see your page that makes people be your referral or decide to join WA? Here is the link to my custom WA home page that I use to get referrals. How do we make a custom WA homepage like yours? I 'm feeling stupid like I missed something in the training that I just read. I love the way you explain things in a simple way for those of us who have to read things several times.Videos do not work well for me unless I have read the material already. Thank you for your help in advance. You are welcome. This wasn't really discussed in any training. Kyle mentioned the ability to create a custom home page in one of his blogs. I'm starting to get this WA learning. I love your method of teaching - it's easy to understand. Thank you Katherine. I always try to make my tutorials as easy to understand as possible. This helps many to learn something that is explained in a different way from others here at WA. Hi there. I'm creating a page on my website to promote WA and will be using one of the banners offered here. Do I have to do something prior to link the sign ups to my account. How does WA know that I had created the promotion? Thanks! If you are using your WA affiliate link with the banner image or using the html code of the banner itself, WA will know that you are the creator of the promotion because of your affiliate ID number which is in both your affiliate link and html banner code. Could you please do me a favor and look at my latest post regarding the promotion of Wealthy Affiliate. I posted on Facebook, Twitter and Google+. I want to make sure it's not too wordy and whether you have any suggestions how to get more people to find it. It is definitely not too wordy. In fact you should add some more content and one or two more relevant images. Also use H3 or H4 Heading Tags between paragraphs instead of just BOLD text. Look at my post and see how I use Light Blue H3 Heading Tags between my paragraphs and how that makes the content pop out at you. Thanks so much for the tutorial... This is very helpful and easy to follow. You are welcome Alexandra. I am happy you found this tutorial helpful. This is an awesome training, applied it and result much better, lead are coming but no sale yet. Thank you sir for this info training. You are welcome. Leads will always be easier than sales. Sales will take weeks and months to materialize. It all depends on your content and how visible it is for people in your niche. Sorry Robert for the dumb question and thank you because I got my answer on the next page here. Hello I have just got the starter membership a few days ago and haven't even set up a pay pal account because I lost track of my last pay pal account. All of this info makes some sense to me but is also somewhat confusing. Is it normal that people don't have a good understanding when they first join wealthy affiliate,and it could take some time to get a good understanding of the topics you are talking about here? Yes. There is a lot of information to absorb and sometimes people need to go through the training more than once to fully understand it. Experience is the mother of wisdom. I somehow gain some good results after your training. You make this community awesome. Thanks so much. You are welcome and thank you for your praise in my contributions to the community. I always follow your training you make it easy and understable. You are welcome. I always try to make my training as simple to understand as possible. An other great straight to the point training from you! Making my customised homepage right now! Thank you Mira. Happy I was able to help you out. You are welcome. All the best with your newly customized WA homepage. If I may ask, would it be possible to create links for WA Referrals without building a website? Of course. Your WA blogs can be used to get referrals. I have received many referrals from sharing my WA blogs on social media and my website. The best reason for using a WA blog is that you do not need to use the affiliate link for it. Because you are the creator of the blog you will automatically get referral credit when someone joins WA through it. Thanks again for another valuable information Boomer! Thank you. Very informative and useful training. You are welcome. Happy you found it informative. Really helpful training, thank you. Thanks a bunch Boomer...I'm so glad that I'm reading this now, new to this and it's all new to me. Going to read some more, thanks again. You are welcome. Learn it at your own speed. There is no rush. I am not like you but that is what I am aiming for my friend... Just give me some time and I be kind of like you when I grow up LOL ;)...! Ok... been writing voiding the actual website and page organization but it's time my FRIEND I can't no longer be a punk. Starting tomorrow I will not. Only read but actually perform this instructions as I go... Wish me luck and I will keep you posted on my progress ;)...! You are definitely a wealth of information my friend and I love it... my brain having a hard time wrapping this information clearly but thank you because I can read it over and over again until I get it right. Well, keep it up my friend boomergp08 is working for this old lady lol ;)...! Thank you for this training.Pandora's box begins to open for me, slowly but surely. You are welcome. Let the fun begin! Thank you for clarifying this. Your posts are very valuable. Thank you. I am happy you find them helpful. Great explanations.... thank you so much! You are welcome. I hope it was helpful. Great info Boomer! Like always from you, thanks! What does it mean then? How did they sign up to WA? Where are you seeing Website Join? Not in your tutorial, I mean on my stats page in the WA affiliate program. Do you know what it means? 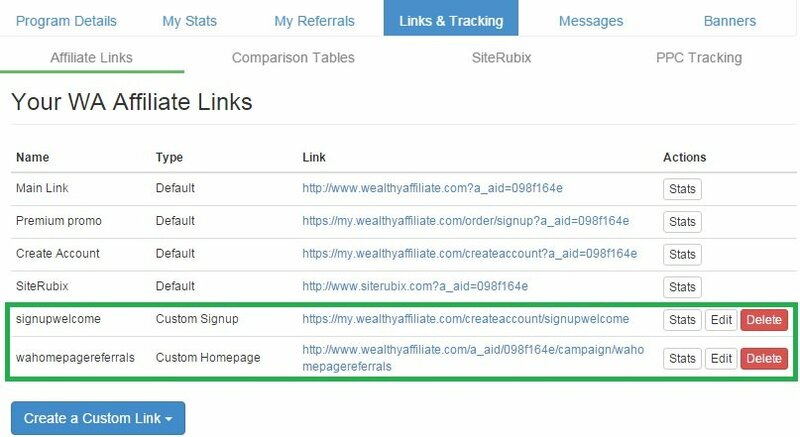 If you mean Website Join Referral that is someone who joins through the WA home page join form, as seen at the below link. Ok, that is intreresting... I haven´t got many of those at all until yesterday (and today) when most of my refferals all of a sudden joins that way :) Hmm.. It all depends if and when a person decides to click through to that page or signs up earlier in the process. Very good of you to set this out so clearly. You are welcome Iv. I hope this helps you out. I finally customized mine. I saw your training when you first posted it and another member gave me a quick rundown on how to do it when it popped back up on my plate ha. Your training attracted me, not just for the cutomization but, for the visual on what a new potential WA tribe member sees. It's imporatant for us to know that. I have figured out how to create a custom "Create Account" page which is great if I ever want to send someone directly to that page, however, I do not see a way to change it to the default "Create Account" page. When people click on the links you mention about, they get the default version from WA. Do you know if there's any way to change the default to my new custom version? The Default Create Account modal cannot be changed because it is part of both your Custom and the WA home page. If you scroll all the way down to the bottom of the page you will see another join form, that is the Default Create Account modal. Thanks for this training! It has enlightened me. Thanks! I didn't know we could create a custom WA home page. I'll add that to my to do list. Yes we can and other custom links as well. I am actually in the process of creating a new training tutorial on all of the custom affiliate links available to us all. I will be posting this training within a couple of days. You are welcome Helen. I'm always happy to share what I know. Is there a way to use the signup screen with video playback as a custom signup? Is it only available when non-members visit WA? I wish there was a way to customize it, but because it is not an actual page and only a popup, there is no way to make it custom. As for when it appears, yes, it only appears when a non-WA member begins reading any WA content. To bad, I wanted to use the video to seal the deal. Can do a custom sign with customized widgets? WA only offers 2 or 3 signup forms you can customize. Perhaps more will come in the near future. 1) Just go to your WA Affiliate Program page by clicking on the Black & White airplane icon at the top of this screen. 2) Then click on the Links & Tracking tab at the top of that screen. 3) On the next page you should see a Blue button that says "Create a Custom Link"
4) Click on that button and select "Custom Homepage Link" and follow instructions. Looks super at first read.. I will let you know how it turns out after I set it up . Thanks Boomergp08. Thanks for stopping by and bookmarking the training Marion. Thank you Robert. Any suggestions on how to promote WA in a face-to-face setting? Have your smartphone, tablet or computer available to show people how and what WA is. Then give them your affiliate link or a link to your WA promotional website. Whatever you do, do not let them join on your device or computer. They need to do so on their own computer otherwise they may not be able to sign in and/or you will not get credit. I kind a knew about these, but you have clarified the total structure a lot. Lets say I do a brief post on my Google + and/or Fb home pages referencing the "Best Internet Business Training Platform on the web" or "Build and host 2 websites at zero cost to you" ... or something like that, with a link to say my Default Create Account Modal. I would get credit for any one who provided their information after clicking through on the link provided? Thanks Craig ... I think I knew that (from one of your posts). I've toyed with the notion of adding a WA landing page to my niche site, but maybe it's smarter to just wait till I start Bootcamp training and my WA Affiliate site. Yes, Craig is correct, especially for Google+ and partially for Facebook. Though FB has been getting a little picky lately with WA links, I still see people posting them. I also know personally that I never have a problem with my custom WA home page link. For some reason FB is cool with that one. Thanks Robert, great training, I learned a few things here to pit into practice! You are welcome John. Happy to have shared some knowledge. Thank you Robert, I have a couple of fledgling sites promoting WA, which I need to expand. Wow! You have more than one website promoting WA? Why? One is all you really need. I have had an interest in exact match keyword domain names for quite a while now and tend to experiment to see whether they really do make any difference, (re. keywords/markets). I am still undecided. The domains in question were apparently websites in the past. I will let you know if I see any appreciable difference. Oh I see. I personally like exact match domains and all of my websites are just that. So far I have ranked well with them, but I do not have more than one within the same niche. That just seems too counter-productive and too much work. The content I have on the two sites is not drastically different, it can't really be, as otherwise I wouldn't be able to tell whether differences in traffic were due to the content, or the domains, so it doesn't create as much extra work as you might think. If one performs significantly better than the other, I will drop the poor performing one. I am also interested to see if there are any geographical differences. Just remember, Google likes fresh and unique content. If you have content that is similar, your rankings will suffer. Yes, I will need to keep an eye on it. Wonderful training Robert, Thanks for creating it!!! You are welcome Sylvia. Happy you liked my training. Thank you Robert, that is very clear now. Very useful for tracking purposes, and I did not know what most of them referred to. You are welcome Ange. Happy to have helped out. Thanks Robert, interesting, l have referred 10 people to WA but if you ask me how,,l will not even be able to answer because l don't know for sure how l did it.just got lucky. Will follow this,give it a go and see what comes out of it. They could have joined through a WA Blog or Question Discussion you created or the WA banner link in the side bar of your website. WA calls their Site Rubix widget a plugin. This is where anyone can type in a domain name to see if it is available, and then place this in their content as a way to get people to possibl join WA. Summer was great here. Thanks, I will. I always like plugin, if WA can provide us all sort of embed code will increase chances of sign up. Our own WA opt in form that can place on side bar. Imagine video within WA have embed code with our affiliate link that can put in within our website like YouTube. WA keyword tools with similar Jaaxy plugin box. I agree with you! I like that idea and it wouldn't surprise me if Kyle and Carson have considered doing something like that in the near future. I know they are working on some cool hings behind the scenes that will be released next year. 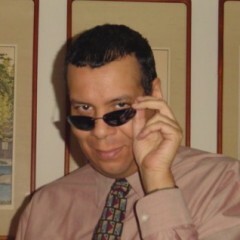 Hi Robert, thanks for more excellent training. I use the Comparison Chart and the Get Your Free Website Here as well as Build a Free Website Here links at the bottom of each page I review. Is this too many? I currently have four reviews comparing them to WA. Bookmarked your training for further reading. Hey Brian! Do you mean you have them at the bottom of "every" page on your website or just on the bottom of every "review" page? Thanks for the quick reply Robert, just on every review page. Oh, OK. Then that is fine. At the end of every review page is understandable and relevant. Thank you so much for explaining this. Up to now I'm still making sense of how to read those stats. haha! Will have to read this training over and over again. Thanks again. You are welcome Raymond. The Stats are not that hard. Just know they only pertain to WA content and affiliate links. They do not track your website stats. You do not need to put these links on your website. You can share them in an email or social media too. If you do put them on your website, yes, you do not want to put many. If you have a website that promotes WA then you should have all of your affiliate text links within your WA Review page. Every WA Blog and Question Discussion you create here at WA is its own affiliate link which naturally gets shared because it gets indexed into Google. Good timing, I'm just starting to promote WA. Thanks! Awesome! You are welcome Meredith! You are welcome Trish. I hope it is of help to you. Awesome training ! Just what I needed. Thank you for sharing and clicked Facebook. You are welcome Linda! I hope you will benefit from it. You are welcome Alexander! Just want people to know what WA has given them to use. b08 you've done it again...showing us instead of telling us...how to monetize WA...definitely more of what's needed...KEEP IT UP MAN!! Thank you Derrick! We all want to make money and I just want people to know what WA has provided for us all. Just the kind of training I'm looking for. Thank you for sharing. WOW, you the man! I had no idea that we could create a "custom referral page" to WA. I just created mine, now I have to get busy and replace my old links. Thank you Robert! You are welcome Ken! Though it is almost a tie between how many Premium signups I get between the Custom and the Regular WA home page, as far as initial referrals the Custom WA home page has like a 3 to 1 advantage. Great information here, man. I think some of these things are overlooked and/or people don't realize just how awesome and valuable these tools can be. Truthfully, I wish more private affiliate programs would adopt some of these strategies and put as much time into allowing their affiliates to create such great customized LP's and entrance points. Not to mention, I can think of more than a few products I wish I could create a comparison table for as easily as you can do it with the plugin from here. This is just another small example of why WA is so great. It's truly amazing because I have been insanely busy with my business and away from WA for a little bit. It never ceases to amaze me that nearly every time I come back or log into Jaaxy, there is a new great feature or tool. Always pouring in value and updating tools and resources for their members. It's just awesome to see and NOT something you see everywhere. Thanks again for the great training, man! I agree! There are so many things that WA offers to its members that many do not even know is here. Not only do we get so much for such a low monthly membership, but if anyone would take a little effort to get 3 or more premium referrals, their WA membership would be free, with extra money left over. Unlike other work at home offers and communities that just take and take as far as membership fees and upsells, WA is the opposite and gives and gives. It's a great point. The funny thing is that I have achieved my success in a separate niche altogether. Meaning, I don't promote WA on my site, but it is literally the only resource that I recommend to others who reach out to me and ask how they can get started doing something similar to me and what they need to do. I was in and out of the IM world for a while. Mainly because I got caught up in "shiny object syndrome." Basically, I tell those just looking to get started to avoid a massive amount of headache and money and just start here. It is the ONLY program I found in all of that time that actually provided me with all of the tools, resources, and education that I needed to build a REAL online business. As more and more of my main niche site is becoming automated and I am focusing more time and effort on client's that I build and market websites for, as I have expanded my business, I can't wait until I can start promoting WA. I am glad I didn't rush or try to build 10 affiliate sites at once, but as more time frees up and I can also share more real experience and success with others, I am going to take a dip into that niche and finally get the opportunity to test out some of the great marketing tools that are provided here. I am already a huge fan of the passive income that I can generate through my own affiliate site, but to have passive income inside of a passive income business model....yes, please! LOL! Never thought I would be so "rah, rah" about any program, online. This is the one and only that I don't really care if people think I am just "hyping" or "sucking up" because when you FINALLY break free from the struggle and can point back to a single resource that played an integral role in changing everything...you want to scream it from the rooftops. WA! WORD! I only started promoting WA after my first 2 websites in other niches. I didn't and still don't see the point in promoting WA until you know how it really can benefit you. But the beauty about the affiliate links that WA gives all of us is so we can passively promote WA without having a WA promotional WA. Just share our links. How do you get to each of those pages? How did you customize yours? If you have your own domain why would you use your Site Rubix site ? This sounds like another training. You can access them all on your WA Affiliate Program page and then click the Links & Tracking tab at the top of the screen. To customize your WA Home Page, on the Links & Tracking screen, click the blue button that says "Create a Custom Link." The Site Rubix link is not to a Site Rubix website. The link is to a Site Rubix Join Screen so people can join WA. Great - simple and straightforward. Saved for future reference. You are welcome Victoria. Happy you liked it. Hey Joze! I haven't seen you in a while. Thanks for the comment! They all work use them all friends. You are welcome Ken. Thanks for the comment. This is great! Thanks for sharing Robert. Thank you Tanya. Happy you liked it.